Get-Started Pinterest Campaign Tutorial exclusively for Hand Made Jewellery Designers. 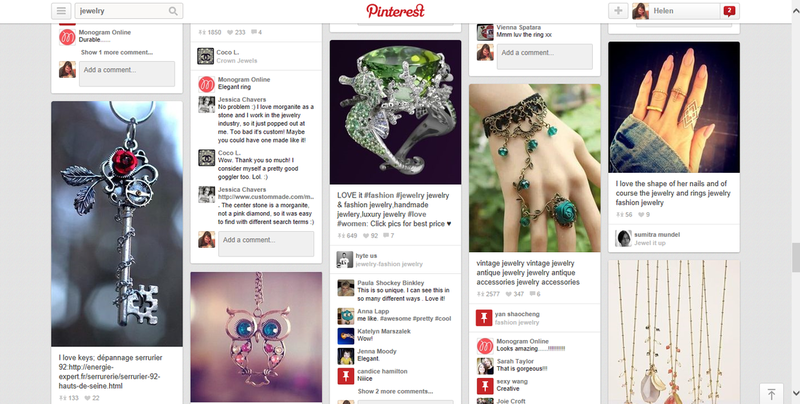 Why Pinterest for the Jewellery Business? OK, this may seem like a crazy idea at first. How can Pinterest help my business? It will probably look like a strange idea at first glance, and may even seem like a stupid idea. Don’t be fooled. The thing is, research has shown that "Pinterest" gets a higher click-through-rate than facebook; twitter; and may have more of an impact than LinkedIn. Also a large proportion of the people who use Pinterest are women (80 percent) and aged 25 to 44; women who like visually appealing things. Women who like shopping? Does that sound like a bunch of people you’d like to be visiting your website? As you’re probably aware, you’ll eventually need a Pinterest Account for your Jewellery Business. If you haven’t got one yet, don’t panic, it’s easy to set up. And this tutorial also has some " Top Tips" for setting an account up from scratch that will help you out, if you are just starting, as well as a clever to add value to your overall Pinterest/Website marketing plan too. There is an option to set up a business account with Pinterest that you can consider. I go through this in the gig. It has advantages, and can make you appear more professional. This is something you can research and decide as we go? https://www.pinterest.com/business/create. It is worth a little time deciding on the name for your overall Pinterest account too. It will have ramifications later as your boards develop. Again, this is something I go through in the tutorial. This tutorial is written assuming that you already have your own website for your Jewellery business to link to it. If you do, you ideally need to be able to update it, create new pages and maybe even blog posts. If you don’t yet have a website, you can still do this gig, and link through to a website later when you are ready! This tutorial has a nice bonus too if you are a slightly more advanced user, as it will show you how to measure how well your Pinterest campaign is working if you have Google Analytics installed on your website. This simple marketing campaign is a low investment thing you can do easily that may have surprising results. Especially if you get super-creative on the initial board-name choices you make, which I go through in the gig. If you order this course I will send you your own copy of my in-depth, detailed and practical tutorial entitled: ‘Your Get Started Pinterest Campaign’ Tutorial, designed especially with the hand-made Jewellery business in mind. The tutorial has easy, yet practical, step-by-step instructions telling you all you need to do and know to create your first Pinterest Marketing Campaign. Not only will I show you exactly what you need to do in an easy to follow format, but this tutorial also covers how to measure how well your campaign is working using Google Analytics if you have it installed on your website. I explain which elements of Google Analytics are most helpful for monitoring this campaign, and how to use it to help you improve your pinning activity. This campaign tutorial will probably take you about an hour to go through initially, and should then require no more 10-20 minutes of your time per week to manage, once you get going, so that you will continue to engage and entice new people to your website week on week as you start to see the results. This could well turn out to be the best marketing $5 you’ve ever spent.